A year ago, the reporter and photographer took separate trips to Grand Marais to research and take photographs for this feature article about Grand Marais. Emily asked me if I would serve as “ambassador” and set up interviews with characters around town. Since the list of possible characters is endless, it was difficult to select those on the top of the list. I consulted others and some interviews were set up. We are glad that one of the interviews was with Ted Soldenski, who has since passed away. He was sharp until the end, and was also Emily’s favorite interviewee. Finnish fisherman, inventor, boat builder, musician and legendary agate picker Axel Niemi opened his brightly painted Gitche Gumee Agate and History Museum in 1954 to tell the world (or at least the folks that made it to Grand Marais) about his beloved agate. From age 5, a curious Karen Brzys hung out here, learning mineral science from her rockhounding mentor. She was blind until age 10, and “the first thing I saw in my life were agates,” she says. 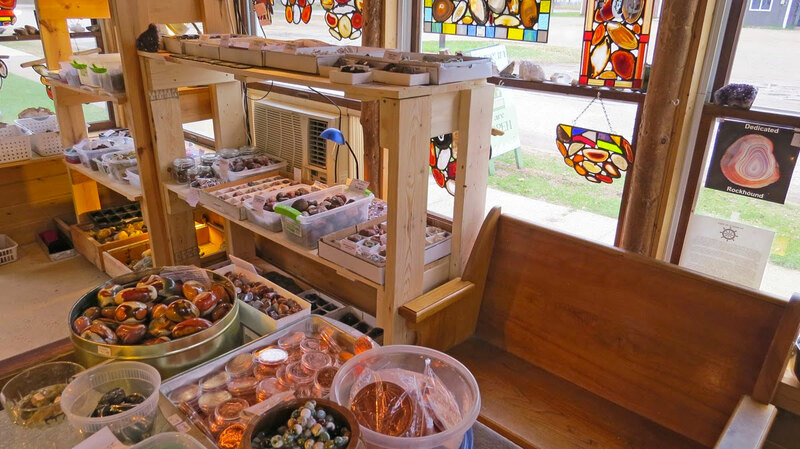 Brzys reopened the museum in 1999 to display agates from near and far and Niemi’s inventions like the four-foot-tall agate view-box with handles and a glass bottom that he took into the shallows of Lake Superior to see rocks below. Poke through bins of agates, thimble-sized and up. Ask Brzys to slip on her goggles to examine your own possible agate finds. Marvel at the fish tug — a classic Great Lakes fishing boat — the Shark, built by the Niemi family, designed for Lake Superior’s rugged wave patterns and the last handmade fish tug left intact in the Great Lakes region. Also at the museum find juicy Grand Marais history (tales of a 45-pound lake trout with two more fish found inside it like Russian nesting dolls), Niemi’s bear coat, homemade puppets, gizmos (check out the Niemi-designed chastity belt!) and a gift shop with an excellent mineral collection and agate plates, lamps and wind chimes crafted by Brzys. For a small fee, she also offers a 20-minute agate class to help you with your hunting and showings of the museum’s “wowser Rocks” mineral specimens.